Other important markets, notably the European Union, have stopped any imports from the 21 businesses under investigation. BRASILIA: Brazil's government has fought to save the country's meat industry from getting burned in a corruption scandal that has prompted several countries to pull Brazilian beef and chicken from the menu. Agriculture Minister Blairo Maggi did not mince his words. "What we are suffering now is a blow, a punch to the stomach," he told the Senate. "We have to recover, to reorganize our forces, to travel around the world and to show that what happened here was that a few people did wrong but that the system or the industry was not at fault." Maggi warned that Brazil's chances are dwindling for realizing ambitions to raise market share in the worldwide food trade to 10 per cent from the current seven per cent. "It's so bad that when I see this seven per cent I start to think that it will be a job to maintain it. I can't imagine getting to 10 per cent. It's a shock," he said. Brazilian meat exports were worth USD 63 million a day until last week's announcement by police of "Operation Weak Flesh," which revealed that some meatpackers had paid crooked inspectors to pass off rotten and adulterated meat as safe. That figure plummeted to about USD 74,000 on Tuesday, the foreign trade ministry said. Brazil's government appealed yesterday to the World Trade Organization's (WTO) 163 other members not to impose "arbitrary" bans on the country's more than USD 13 billion meat export industry. But damage has already been done, with two of the biggest markets, China and Hong Kong, having suspended all imports of beef and chicken. Other important markets, notably the European Union, have stopped any imports from the 21 businesses under investigation. Japan, Brazil's third-biggest market for chicken with USD 720 million in sales, imposed a similar limited ban, while Mexico has stopped imports of chicken produced by the 21 companies under scrutiny. In its letter to the WTO, Brazil pressed its message that a few bad apples are at fault for the scandal and that the Brazilian food industry itself is in good health. It pointed out that of 11,000 employees at the agriculture ministry, 2,300 work as inspectors on animal products and "only 33 individuals are being investigated for improper conduct." 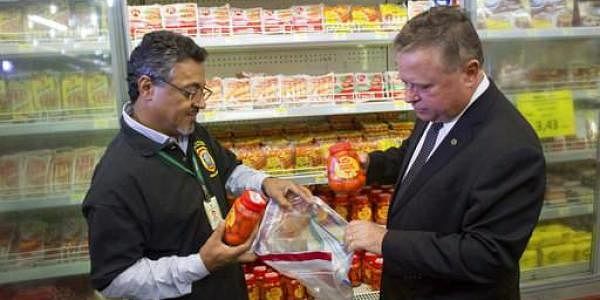 Underlining Brazil's leading position as an exporter of animal products to 150 countries, the letter insisted that the agriculture ministry "is widely recognized for its rigorous and robust inspection service." Markets analyst Andrei Perfeito told AFP that Brazil's fear is that competitors will try to gain ground while this cloud hangs over Brazilian products.